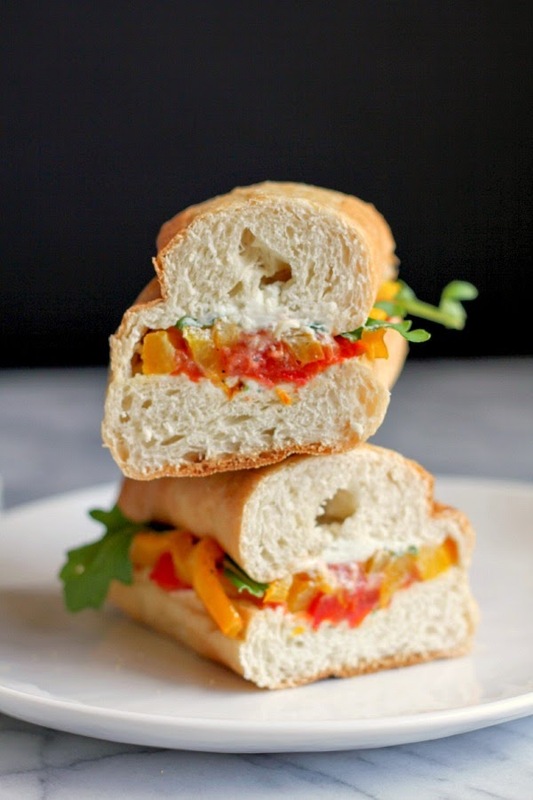 Warm roasted vegetables and creamy goat cheese are the perfect combination for this light and delicious sandwich! I'm seriously considering starting a weekly feature on the blog for lunch recipes. Especially lunches for one. Since I've worked from home for so long, I'm used to eating lunch alone. Some days it's just a turkey sandwich, some days it's a bowl of cereal (yes, it's true), but other days I'm craving a nice, hearty lunch. Something delicious and healthy, but not too difficult or time consuming to make. Last month I shared one of my favorites, this Rigatoni with Kale and Tomatoes in Brown Butter. I literally could eat that dish every single day. It's that good. But because I like variety, I thought I'd create a few more easy lunches to have on hand. This sandwich was born because I had some tomatoes and a yellow pepper that I needed to use up ASAP. They were getting a little soft so I decided that roasting them would be the right thing to do. So I sliced everything up and roasted it until it was nice and tender and juicy. I added spicy arugula to give the sandwich a little kick. And you simply can't go wrong with goat cheese. Especially when it's herb and garlic goat cheese. 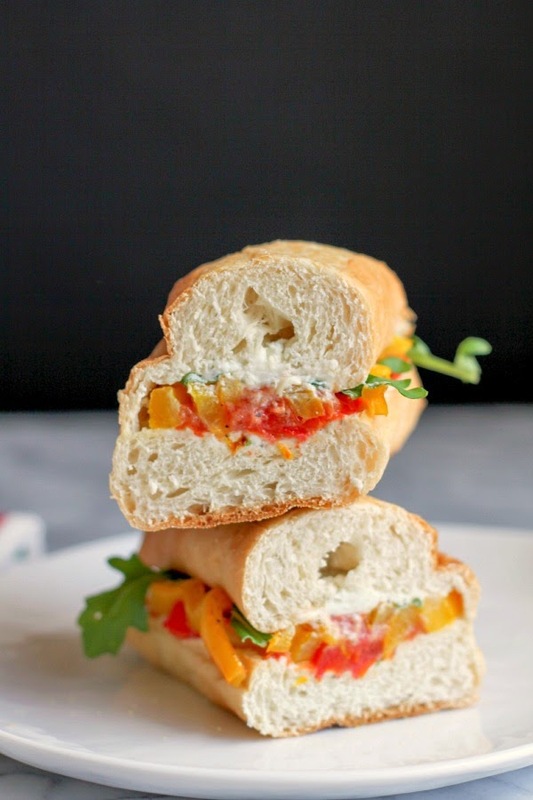 So flavorful and perfect for this sandwich. Preheat the oven to 425 degrees. Cut the tomato and pepper into thick slices. Lay the slices onto a small baking sheet and drizzle with the olive oil. Sprinkle with salt and pepper and roast for 15 minutes, or until the vegetables are tender and starting to brown. Cut open the sub bun and spread a tablespoon of the goat cheese on the inside of each half. 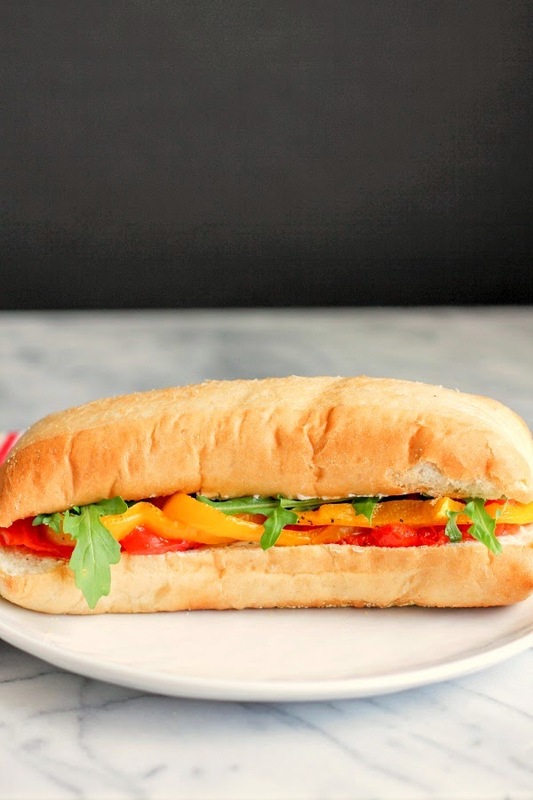 Lay the roasted vegetables on the bottom half, then top with the arugula. Sprinkle with just a pinch more of both salt and pepper. Cut the sandwich in half and enjoy.